When the day of Pentecost had come, [the apostles’] were all together in one place. And suddenly from heaven there came a sound like the rush of a violent wind, and it filled the entire house where they were sitting. Divided tongues, as of fire, appeared among them, and a tongue rested on each of them. All of them were filled with the Holy Spirit and began to speak in other languages, as the Spirit gave them ability. 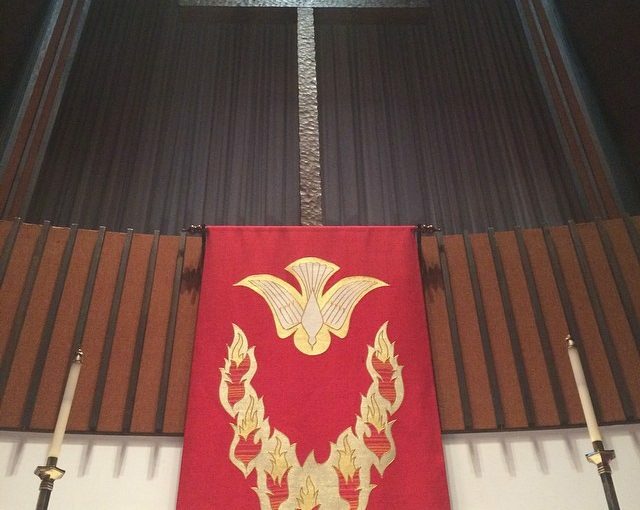 My sermon from Pentecost (June 4, 2017) on Acts 2:1-21. Listen to the recording at the bottom of the page or read my manuscript below. What do you do when you see storm clouds moving towards you? That question has been on my mind since Wednesday night, after I spotted a thunderstorm south of here. I had just left a church meeting and was busy trying to convince my four year old and two year old that staying in their car seats was actually a good idea, when someone pointed out bright flashes lighting up the southern sky. As we looked through the tops of trees, we could see bolts of lightning flashing from cloud to cloud. We couldn’t hear any thunder. And I don’t recall any gusts of wind. But I do remember staring intently at those storm clouds as they moved from west to east. As I put my two kids in their car seats, and I said goodnight to those who attended that church meeting, I kept my eyes turned south. I wanted to know where the storm was going and if I needed to rush home to close some windows before the rain came. But as I stared at that storm, I realized I was also looking for something else. Even though it was dark and the flashes of lightning were the only thing illuminating the storm itself, my eyes were trying to see what the clouds themselves were doing. I strained my eyes trying to see if the clouds were rotating. Regardless of where I am or what time of day it is or even whether the clouds are bringing rain or snow, the first thing I do when I see a storm is to look for clouds rotating around each other. As a kid growing up where the Rocky Mountains met the Great Plains of the midwest, violent winds were just a part of life. During the school year, instead of lock down drills, we had tornado drills. I remember learning how to go into the hallways of my elementary school, kneeling down on the floor, and covering my head and neck. I watched countless cheesy made-for-school movies about what happens to a house when a tornado comes and how the wind announces itself by sounding like a freight train. When a violent wind comes, we were taught to never go towards it. If we were caught outside and couldn’t get into a basement, we were told to run into a ditch and cover our head. We learned how it’s safer to run and hide than trying to outrun a tornado in a car. Violents winds are scary. Violent winds are not something were called to confront. When a violent wind comes, like a tornado or a hurricane or a superstorm, we’re told to find someplace safe. We’re told to protect ourselves. We’re told to stay away. Which is why, when it comes to our reading from the book of Acts today, I wonder: why didn’t the disciples run? When the wind began to blow, when the curtains and doors started to shake, when the wind blew out the candles and knocked papers and dishes onto the floor, when the entire house itself shook – why did they stay? And why did the Spirit of God come to them in this frightening, terrifying, and completely disruptive way? We have a tendency in the wider church to make the Spirit….safe. We cling to images of the Spirit as a dove, as a little white and fluffy bird. The bird is perfect, without blemish, a bird we think is beautiful enough to have been sent out from the Ark by Noah and to announce who Jesus is at His baptism. And when the bird moves, it never really seems to flap its wings. It just seems to float and glide, as if it fell off a cloud in heaven, caught a bit of an updraft, and is taking it’s time to, ever so gently, come down to earth. When this dove finally lands, making itself known to us, this Spirit doesn’t land with a thud. Instead, we imagine it landing on us with grace and gentleness and comfort, like a feather floating from heaven. This image of the Spirit is very calming. It’s peaceful. It’s comforting because it doesn’t really challenge us. A dove doesn’t ask us to do much. A dove is soft and cuddly and doesn’t disrupt the world around us. A dove invites us in a gentle way to be a little more holy, a little more Christ like, and to share Jesus in whatever way we find comfortable. A dove….isn’t a violent wind. A dove doesn’t shake an entire house. A dove doesn’t knock everything onto the floor, making a mess of everything we set-up and planned for. And a dove doesn’t immediately cause us to go out into the street and start babbling in languages that only immigrants and foreigners and non-citizens understand. Keeping the Spirit as a dove is safe. Keeping the Spirit as a dove keeps us from seeing what the Spirit does. We don’t want to imagine God’s Spirit literally blowing us out the front door, out of our comfort zones, moving us away from everything we know and love and that keeps us safe until we suddenly find ourselves face to face with people who aren’t like us, who don’t believe like us, but who God has put in our path to know, and to love, and to share Jesus with. When we keep the Spirit locked into the image of a dove, the Spirit stays small, contained, and feels like it’s only designed for me, myself, and I. But when we let the Spirit be the Spirit, we recognize how God’s Spirit shakes our homes, upending the order and stability we built for ourselves, forcing us to do uncomfortable, scary, and even mind-boggling things – all for this wacky thing we call faith. When we let the Spirit be the Spirit, we recognize how the Spirit isn’t only a thing or a force or a wind or some abstract metaphysical concept designed by pastors to confuse and confound Confirmands (like Connor, Josette, and Brendan). The Spirit, at its core, is a promise – a promise that God made to each of us. When God first met us, God made a promise to know us. When Jesus first called us by our name, he made a promise to be with us, no matter what. And when the Spirit was first breathed into us, the Spirit of God, the Spirit of Jesus, the presence of everything holy and divine was wrapped around us, tight. Right now, the mighty wind that shook the apostles’ house is the same Spirit shaking you. The Spirit that makes old men dream dreams is the same Spirit inviting you into the dreams God has for each of you. The Spirit is not abstract. The Spirit is more than a dove. The Spirit is the promise that you have value; that you have worth; and that a world filled with different kind of people from different kinds of places, from Mesopotamia to Cappadocia, from Rome to Arabia, is not a world where God’s love is reserved for a select few. Rather, the Spirit that holds you is the same Spirit that is moving you to help others discover a new vision of love and hope and to dream dreams of safety and peace. In a world where the violent winds of hate and fear, of climate change and terror, of sin and war, cast a long and dark cloud over everyone, the promise that holds you tight is that no wind or evil or even death itself can blow Jesus’ love and care away from you. When the storm clouds come, when they twist and twirl and rotate around you, cling to the promise that the Spirit is with you, the Spirit is acting through you, and that God’s love cannot be torn away from you. The storms in your life, no matter how strong, will not win because the Spirit of God, the Spirit of Jesus, the Spirit of the Holy Trinity, will carry you through.